This bourbon chicken recipe is a winner! 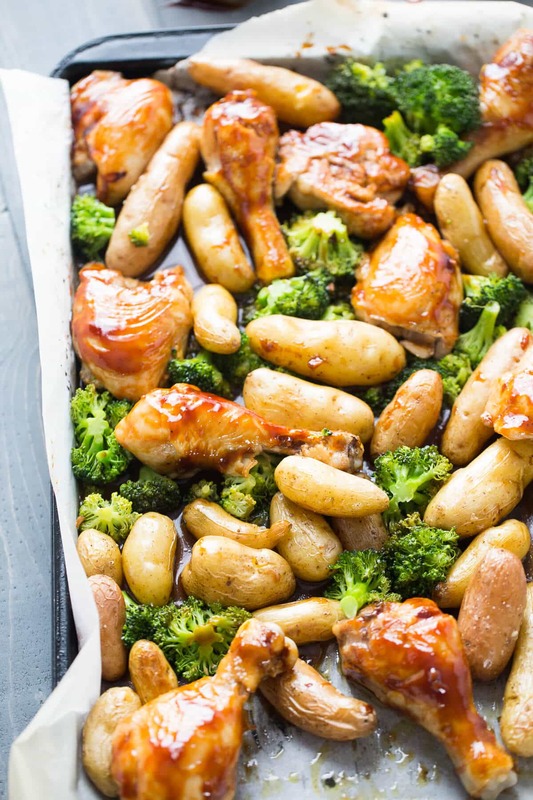 Anytime dinner only takes one pan and tastes this good has to be good! One of my favorite food court meals has always been bourbon chicken. There was a time where my friends and I would go to the mall every Saturday when I was in college. While we never had a lot of money to spend, we somehow always managed to scrape up enough money to treat ourselves to lunch. There was something so addictive about that food court bourbon chicken! The sauce was thick and tangy with a hint of sweetness. Everything about the sauce appealed to my senses. It smelled good, tasted good, and looked good. And it didn’t require much in the way of sides. It was perfect with rice or all on its own. I am fairly sure I ate that chicken every weekend for six months straight. I only stopped because I got a job. No job, no money. No money, no bourbon chicken. I forgot my old favorite meal until now. I figured it was time to teach the family all about bourbon chicken. 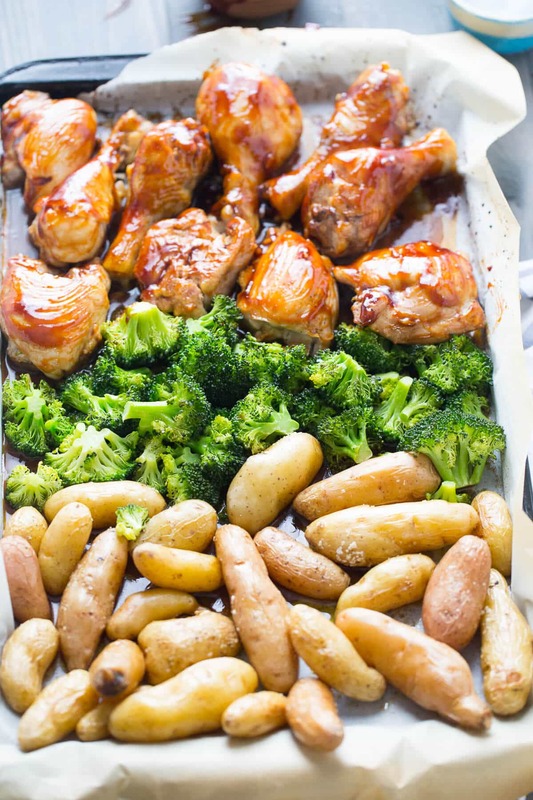 Making this recipe at home would mean that I can control things like fat and sodium and turn this into a sheet pan dinner meant that I could make it a simple, everyday recipe. I used chicken thighs and drumsticks for this recipe. 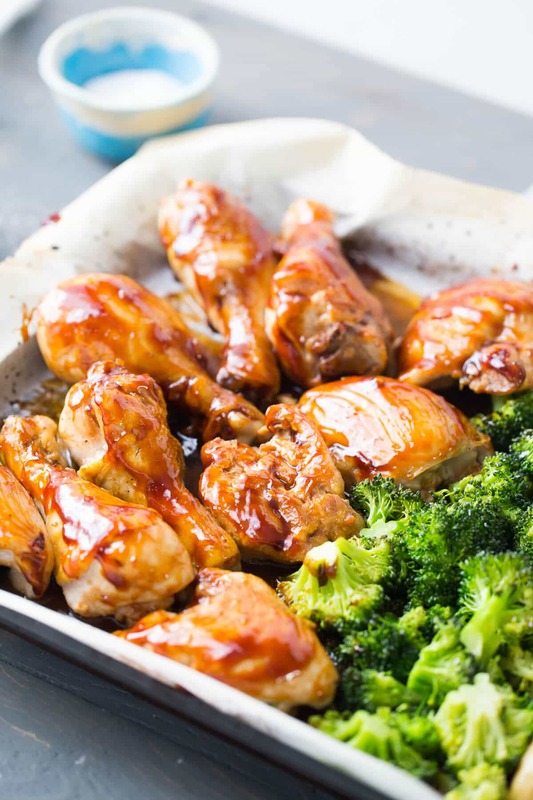 The darker meat stayed moist during the cooking and tends to add a lot of flavor to any dish like these sesame ginger chicken thighs or these grilled chicken drumsticks. 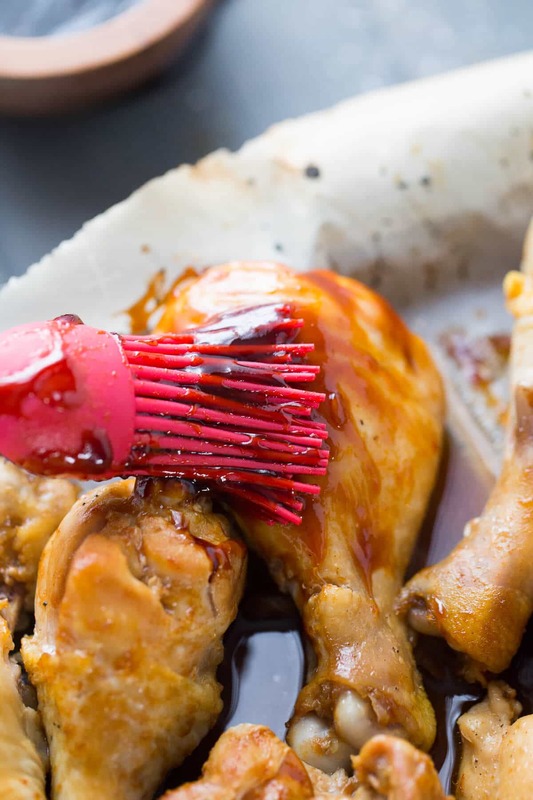 The sauce for this bourbon chicken is so simple, and chances are you have all the ingredients in your pantry. I roasted potatoes and broccoli alongside my chicken, but you could easily substitute your favorite veggies. While this recipe is simple, you will need to work in stages. Prepare your sauce while you roast your chicken and potatoes. Baste your chicken and add your broccoli. 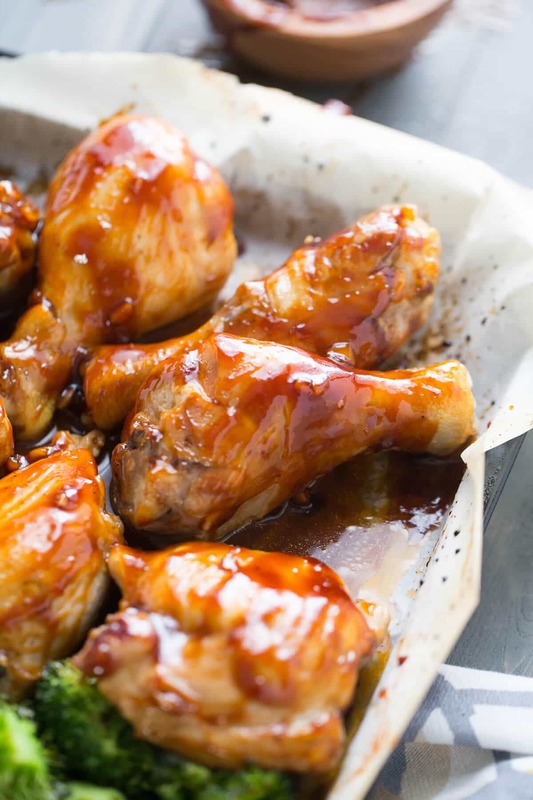 Before long your kitchen will be filled with that special, savory/sweet aroma that comes from a good bourbon chicken recipe! 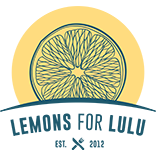 I’m sharing this recipe with Food Fanatic! looks wonderful, great sweet savory combination in the sauce, and must have somehow missed tasting this dish before, so thank you for the recipe and the dish, I love thighs too, so much better than skinless and tasteless chicken breasts! Thank you Sabrina! Thighs are so good, they really have so much flavor!